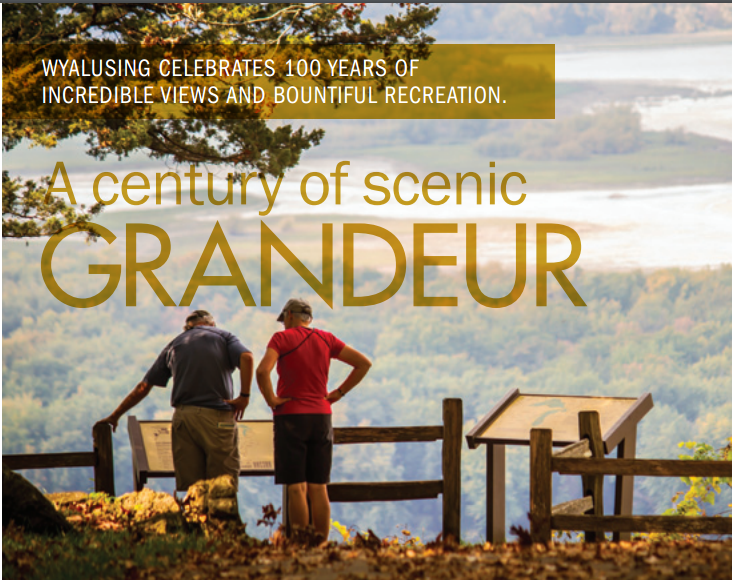 Please note: The Friends of Wyalusing State Park has been changed. The May meeting will be held on May 17. See the calendar. Libby Zeman and Alex Stark led 8 birders through an early morning bird walk/drive through Wyalusing State Park May 2, 2010. The group started at the boat landing. Out at the dock, the group saw Lesser Yellowlegs, Northern Rough-winged Swallow, Tree Swallow and Blue-winged Teal. "The best part was when we were watching the Yellowlegs, a Prothonotary Warbler(left) sang VERY close to us! The whole group turned around and there is the beautiful guy singing proudly. It then flew across the parking lot and landed on the antennae of a group members car. It was definetly great views and a 'life bird' for a few. The next highlight was a fly-by Osprey that was an unexpected bonus. " said Alex. there they walked up to the Passenger Pigeon monument, then Sentinel Ridge Trail to Point Lookout and back to the vehicles. The drive up to the fork in the road didn't produce much other than Balitimore Orioles, House Wrens, Ovenbirds, Pileated Woodpeckers, Chipping Sparrows and Blue-gray Gnatcatchers. The walk was much more productive. 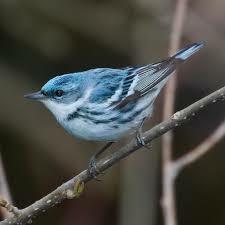 The group spotted a singing Wood Thrush, Cerulean Warblers, Tennessee Warbler, Ovenbirds and a Yellow-throated Vireo. 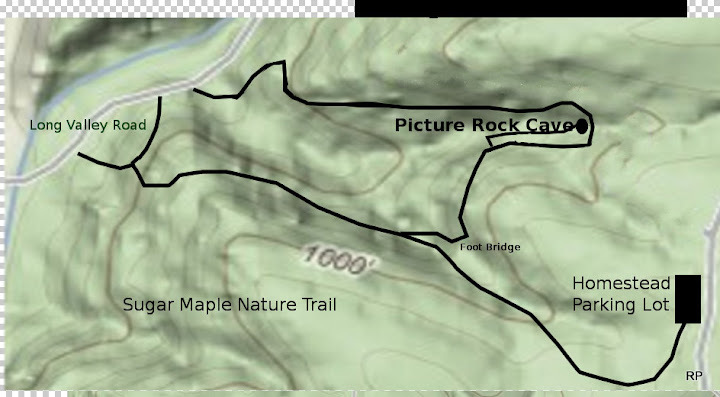 At the fork in the road and farther down the trail the group found Myrtle Warblers. The group reached Lookout Point a little before 10 AM. It was almost silent. There was some Bank Swallow activity and a singing Cerulean Warbler(Left) and Nashville Warbler (no Summer Tanager activity either). The official bird walk was concluded upon return to the vehicles. 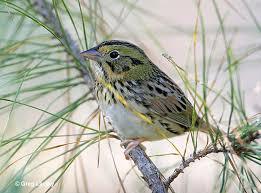 Libby and Alex and a few others went to the oak savannah to find a Henslow's Sparrow. Earlier Libby and Alex had found Ring-necked Phesant, Y ellow Warbler, White-crowned and White-throated Sparrows but couldn't relocate them. The smaller group DID find a singing Henslow's(right) Sparrow on top of a tree. A 40x scope afforded spectacular views! 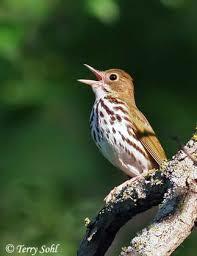 In the area were Eastern Towhee's, Field Sparrows, Gray Catbirds, and Brown Thrashers. At Henneger's Point, a singing Yellow-throated Warbler, Northern Water thrush, Rose-breasted Grosbeak, Red-eyed Vireo and more Wood Thrushes were seen. While eating lunch at a overlook of the river a fairly large sized, black bird flying close to the water with its legs completely extended. A closer look through binoculars revealed a COMMON LOON flying north up the river. Libby and Alex ended up with 11 species of Warblers for the day and 7 species of Sparrows and 65 total species for the morning. Thanks to all participants who enjoyed the morning with us! The Friends of Wyalusing wishes to thank Libby and Alex for their dedication.